I read a brilliant review for this book on Cleopatra Loves Books blog this week and it sold the book to me. I’d previously thought that this wasn’t a book for me but Cleo wrote about it in such a way that it made me feel like I simply had to read the book as soon as I could. I bought a copy a couple of days later and I’m really looking forward to reading it. I’ve had this book on my wish list since I first heard about it last year so when I spotted it in the Kindle sale this week for just £1.99 I snapped it up. I think this is a book that I’ll need to be in the right mood for so hopefully I will be soon. I spotted a tweet this week offering the ebook of this for free so I immediately signed up for a copy. The synopsis really makes me want to read this as soon as I can. Hear Me is a powerful story about life and death, addiction and sobriety, racism and the fight for justice – but above all it is a story about love. I was sent a copy of this to review as I’m taking part in the blog tour for this in May. The synopsis sounds so good and I’m really looking forward to reading this. I received this book at the weekend and there was no note with it so I had no idea where it came from but I finally found out that it was a Goodreads giveaway win. I was thrilled when I opened the package as I’ve been seeing this book on social media and have been so keen to read it. Nineteen fifty-nine. The four Wilde sisters, Margot, Flora, Pam and Dot, are spending the summer in the Cotswolds, at Applecote Manor. Affectionately called the Wildlings, the sisters are exceptionally close, yet this year there’s a sense of nostalgia. Things are changing. Except for Applecote itself, a house that seems frozen in time. The sisters haven’t been there in five years; not since their cousin Audrey mysteriously vanished. But as they discover Applecote’s old secrets and new temptations, the bond between the sisters starts to splinter. Until the night when everything spirals out of control and the Wildlings form a bond far thicker than blood . . . 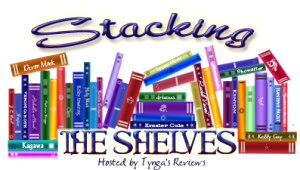 This entry was posted in Book Meme, Books, ebooks, Stacking the Shelves and tagged Ben Winters, Book Haul, Books, ebooks, Eve Chase, Johana Gustawsson, Julia North, Stacking the Shelves, Suellen Dainty. Bookmark the permalink. ← WWW Wednesday (5 April) What are you reading at the moment? Thank you. I was more restrained in my book buying this week so I hope I can keep that up. I’m looking forward to Underground Airlines, it does sound like a good read. I hope you get it soon too. I bought The Housekeeper after reading Cleo’s review too. She’s a great ‘book enabler’! The Eve Chase is on my wishlist, looking forward to reading your review of this one. She really is, I’ve found so many great books through her blog. I was thrilled to win a copy of the Eve Chase book as it does sound excellent. Thank you so much 🙂 I’ll go read your StS post now, thanks for leaving your link. The Housekeeper looks super interesting, I may have to add that to my TBR! Bunch of good looking books though, Happy Reading!! Thank you 🙂 I’m really looking forward to reading The Housekeeper, it sounds like such an interesting read. I’ve been meaning to check out Underground Airlines; I’ve heard good things. Hope you enjoy your haul. I’m really keen to read it so couldn’t resist the bargain price this week. Thank you 🙂 I’ll go read your StS now – I’m a bit behind this week so apologies for that. Yay, we’re both taking part in Block 46’s blog tour! It makes me laugh to try a French author in the English version first, but I’ll make sure to read her books in French too. The Housekeeper sounds extremely good, Cleo’s review was a winner. Happy reading! You certainly did get a lovely lot of books! I’ve had The Housekeeper on my radar for a bit now. So I’ll be especially interested in what you think of that one. I hope you’ll enjoy ’em all. Thank you 🙂 I’m hoping to read The Housekeeper soon, I just need to read a few review books first. Thank you so much 🙂 Hope you had a good weekend too. Ooh, The Vanishing of Audrey Wilde looks very tempting…the cover conjures up that era for me. I also read a lovely review of The Housekeeper, at Cleopatra’s, and downloaded it a couple of weeks ago. She definitely leads me to that “click to buy” feature. Hope to enjoy it. Thanks for sharing, and enjoy your books! The Housekeeper sounds so tempting. Happy reading. The Housekeeper does sound like a good book! I will need to check it out. Have fun reading this week. The Housekeeper certainly sounds like a fun read! I happen to really like that cover as well. Great book haul. I bought three and was give one this week. Bought “The Truth Aouth the Harry Quebert Affair” by a new (to me at any rate) French writer called Joel Dicker (something of a whodunnit but I was fascinated by an interview with him I listened to – part journalistic investigation, part novel, based on (I think) a real disappearance, it (and he sounded) intriguing; A Whoel LIfe” by Robert Seethaler is a novella about solitude and landscape – I think I heard about that on Harriet Gilbert’s A Good Read podcast; “Travels with Herodotus” by Ryszard Kapuscinski, a travelmemoire wiht a difference. And the book given to me was by a Devon writer, J.G Harlond who I met this week as part of my A – Z of Devon of Devon Writers project (see Devon Book Club on Goodreads, Facebook and Twitter if you are interested). The book she gave me is “Local Resistance”, a mystery set in wartime Cornwall. Jane has a fascinating international career in education and has travelled widely. I very much enjoyed meeting her and am looking forward to reading her book. My NY Resolution to bring down the tbr list is failing – I’ve no discpiline! I’m not really familiar with the books that you got this week, but I hope you enjoy them! Great haul! Hear me looks amazing! I hope you’ll enjoy all the books you got! Happy reading!